Double Olympic champion Mo Farah broke Steve Cram’s 28-year 1500m British record at the Diamond League in Monaco. The Briton is remarkably the sixth fastest man over the distance, clocking three minutes and 28.81 seconds to also become the European record holder. Farah, the 5,000m and 10,000m Olympic champion, was second behind Kenya’s Asbel Kiprop who recorded a world-leading time of 3:27.72. “I’m pleased, it was weird competing in a new event,” said the 30-year-old. Former world-record holder Cram, whose time of 3:29.67 secs had stood as a British record since 16 July 1985, said he was shocked after witnessing Farah’s “unbelievable” run. The time also eclipsed the personal bests set by Sebastian Coe (3:29.77) in 1986 and Steve Ovett (3:30.77) in 1983 who are second and third respectively on Britain’s all-time list for 1500m. The Londoner had decided to test himself in an unfamiliar event to improve his speed ahead of next month’s World Championships in Moscow where he will double up in the 5,000m and 10,000m. He would not have expected records to fall his way. Farah finds himself higher on the world all-time list for the 1500m than he is over the events in which he is reigning Olympic champion. He is also the first Briton in 16 years to hold the 1500m European record, breaking the 3:28.95 mark set by Spain’s Fermin Cacho in 1997. “Training has been going pretty well. The aim was to work on the speed. It would have been nice to get closer to Kiprop but he is a different class,” Farah told BBC Sport. Farah was just two years old when Cram, then 24, became the first athlete to dip under the 3:30 barrier on a balmy evening in Nice 28 years ago. “I am shocked in a great way,” said Cram, who was commentating on the race for BBC Sport. For all of Farah’s achievements, however, he finished a distant second to world champion Kiprop who is now the fourth fastest 1500m runner in history after his victory at Stade Louis II. Farah was also reminded of the task ahead of him in Russia when Edwin Cheruiyot Sol ran the quickest 5,000m of the year. The Kenyan’s time of 12 minutes and 51.34 seconds pushed Bahrain’s Albert Rop into second. Elsewhere, Britain’s Tiffany Porter was fourth in the women’s 100m hurdles, while a 6.74m leap secured third spot for Britain’s Shara Proctor in the women’s long jump and a season’s best 5.70m saw Britain’s Steve Lewis come sixth in the men’s pole vault. 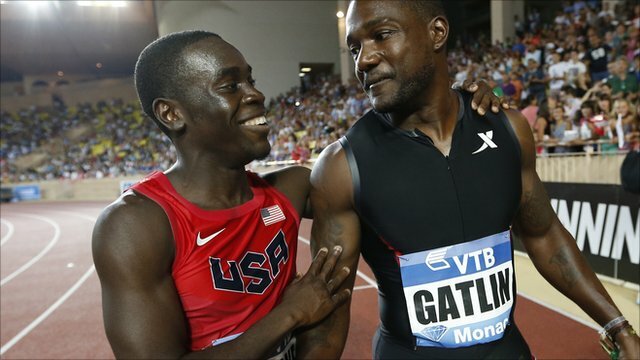 America’s Justin Gatlin won the men’s 100m in 9.94 secs and his compatriot Duane Solomon took the men’s 800m. There was a surprise winner in the men’s 400m hurdles, a race which started without reigning world champion Dai Greene after the Welshman withdrew a few hours before the contest with an Achilles problem. Diamond League leader Javier Culson was expected to record another victory but the Puerto Rican was overhauled on the home straight by Trinidad’s Jehue Gordon, who shaved a second off his personal best to dip home in 48.00secs.